Have you seen the photo of the bird caught in plastic bottle rings? Or the dolphin that choked from a bag noose? How about the stomach contents of birds that have ingested a weird composite of plastic gizmos and toys? Water animals from the largest whales to the smallest zooplankton eat microplastics—bits from larger pieces of plastic that are smaller than one-fifth of an inch in size. What have we done to our beautiful world and oceans? Plastic is everywhere. 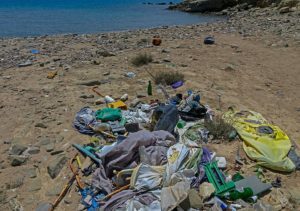 In fact, if you look at your surroundings, you will see multiple plastic items—colored pens, mirror frames, a hair brush, toys and balloons, lamps, food bottles, a garden hose, a button, a pail, a drinking straw, a contact lens and more. Basically, plastic is a synthetic material made from oil, a raw material—you could say it is made up of recycled dinosaurs (or fossil fuels). It can be molded into any shape and take on any color. Plastic can even be made to look like wood, to resemble stone and to mirror glass. All things considered, plastic is cheap to produce, lightweight, and often less expensive than most other materials. Plastic production is a two-part process: the raw materials are mixed with gas and other chemicals to form a resin, which is turned into granules that can look like tiny jewelry beads. When they are heated and become liquid they are be poured into any type of casting mold to form a shape or they can be extruded and shaped like hoses and pipes. In other forms of design, plastic is squashed into other materials in a process called laminating, such as what is often done with partially-made wood flooring or decking. The good thing about plastic is it can be made over and over. The horrible thing about plastic is it never rots nor disintegrates. It hangs around as a plastic bag, a car part, a takeout container, something disposable. So, it winds up in landfills, recycling centers, bales, and, yes, even the ocean. According to National Geographic, “The first plastics made from fossil fuels are just over a century old. They came into widespread use after World War II and are found today in everything from cars to medical devices to food packaging. Their useful lifetime varies. Once disposed of, they break down into smaller fragments that linger for centuries." It’s been said that plastic takes more than 400 years to degrade; but is degrading disintegrating, probably not? Plastic’s history is not new. Celluloid for film was an earlier version of plastic, along with Bakelite for telephones and it was also used as handles on cooking items. Nylon is another form of plastic and was manufactured into tents, stockings and clothing. A huge movement took place in the early 70’s with the first recycling mill to accept residential plastics, which began operations in Conshohocken, Pennsylvania in 1972. And, in 1984, plastic recycling topped 100 million pounds in the U.S. for the first time in the history of recycling. There are lots of different types of resins to be sorted for its properties: polyethylene, polyvinyl chloride, polypropylene; and the specific type of plastic is usually found in a triangle symbol with a number inside and perhaps a code underneath. You can find them on the bottom of bottles. For example, Polyethene is PET #1 and can be found stamped on water bottles. Polystyrene is one of the most common forms also called Styrofoam, or it is also the “take-out carton." Because this type of plastic is so light, it blows around and is hard to collect, and most small-town recycling programs won’t take it. It is estimated that 448 million tons of plastic was produced in 2015. Scientists were blown over by that estimate just recently. The mass production of plastics, which began just six decades ago, has accelerated so rapidly that it has created 8.3 billion metric tons—most of it in disposable products that end up as trash. And more than 6 billion tons of it is just stacking up in landfills, winding up as litter, jamming streams, and making its way into our oceans. Our oceans are turning into plastic soup! If you want to puzzle this out with an image in your mind, picture this: if you spread plastics all out, up to your ankle in depth, it would cover the world’s eighth largest country, Argentina. There are additives that change the structure of plastic during manufacturing. For instance, Phthalates (pronounced ThA-lates), makes plastics softer, and BPA makes plastics harder. These additions to the formula do not have to be proven safe to humans in order to be used in manufacturing—and workers in plastic factories, over the years, have an increased risk of cancer and other health problems. Today they suit up for work like men and women going into space. And another horrible oddity is that plastics (such as floating plastic bags in the waterways) can also absorb toxins that have seeped into the water, so when an animal or bird eats them, they build up toxicity in its body like a poison. There are five ocean whirlpools in our world called Gyres. The “North Pacific Garbage Patch" is a Gyre where floating plastic goes around in a circle along with the current. But, the plastic looks less like an island and more like smog—it’s made up of Nano or micro-plastics, according to the 5 Gyres Institute. And, an interesting fact, when searchers for the Malaysian Airlines Flight 370 were underway, they found ocean garbage instead of crash evidence. Making solar panels from plastic is in the future, perhaps a light bulb that doesn’t shatter, or a plastic balloon to channel the Internet to remote areas of many countries are all new ideas for plastic usage. Businesses are even trying to figure out how to melt plastic in order to turn it back into oil—called a char. A moth named “waxworm" eats plastic and the bacteria in its gut can break down plastic—so scientists are making note of that. Make thoughtful decisions about buying plastic items; refuse to use plastic bags; don’t buy products with microbeads; avoid Styrofoam, plastic utensils and clam-shell packaging. Buy natural fabrics such as wool and cotton and avoid flame-retardant items; and use kitchen products like glass and stainless steel instead of plastic bags and storage wraps. Make coffee the old-fashioned way without the plastic pods or specialized cups. Read labels and know what you are buying and ingesting. Spend time picking up litter and patrolling the beaches for waste. Tell other people what you’ve learned and start a movement in your school or other organizations. Looking for a career? Think about science, engineering or technology—you might just invent the solution the world is looking for to its plastic disaster dilemma . Langley, Andrew, Plastic: Everyday Materials. New York: Crabtree Publishing Company, 2009. Book. Macken, JoAnn Early. Take a Closer Look at Plastic. Sonoma, CA: Red Chair Press LLC, 2016. Book. Plamondon, Chantal & Jay Sinha. Life Without Plastic: The Practical Step-by-Step Guide to Avoiding Plastic to Keep Your Family and the Planet Healthy. Salem, MA: Page Street Press, 2017. Book. Slade, Suzanne. A Plastic Bottle’s Journey. Mankato, MN: Picture Window Books, 2011. Book. HuffPost: “10 Things You Can Do To Reduce Your Plastic Footprint"
Huffington Post: “Heartbreaking Photos Show What Your Trash Does to Animals"
National Geographic: “We Made Plastic…"
“A Whopping 91% of Plastic Isn’t Recycled"